Andreas (Hosemann) Osiander (19 December 1498-17 October 1552) was a Lutheran preacher in Nürnberg, Germany, where he became very influential and participated in all the major church affairs. He violently attacked the Anabaptists from their first appearance, so that they were unable to gain a foothold there. One of the first victims of his hostility was Hans Denck, who was the rector of the school of St. Sebaldus and had joined a group who were dissatisfied with the small improvement in religious and civil life brought about by the Reformation. At Osiander's instigation a course of action was adopted that ended in Denck's expulsion on 21 January 1525, and the later prohibition of the sale of the translation of the Prophets made by Denck and Ludwig Haetzer, even though there was as yet no other German version and the translation was free of anything objectionable. In the official opinion concerning the punishment of the Anabaptists which jurists and theologians presented to the council in July 1528 Osiander advocated the death penalty for Anabaptist preachers, because they were deceivers. To his opinion he added false and garbled statements on the doctrine of the Anabaptists, asserting that they denied the Trinity and therewith the Deity of Christ; in their teaching nothing is found about Christ, except that "we should do and suffer like Him, as if He were merely an example." They would recognize only works, which "Christ has, however, made unnecessary." It is therefore justifiable before God and man "to punish such error with the sword. . . . In addition, imperial law forbids such Anabaptism upon penalty of beheading; therefore it is clear that it is justifiable before God and man." Baptized persons might be given milder punishment as the deceived, such as prison sentences, branding, or exile. Some of the other theologians also favored branding, but not the death penalty. Nevertheless, Osiander had had some misgivings as to the effect of such a course upon his own coreligionists, and therefore advocated that "in this time" it was not useful and good "to apply the severest penalty. In the first place, because I know that if their doctrine and their error really came to the light of day, they are so unchristian that I do not doubt that they would fall of themselves. In the second place, because we have among the Catholics errors just as serious as those of the Anabaptists, . . . it would be a bad state of affairs to punish one party with the sword and not resist the other; for it is well known and evil spoken of, what the Papists still do in corners, and that they are not punished for it. In the third place, because it is evident that the Anabaptists die steadfast; that gives their teaching great respect." In a further opinion of 30 May 1531, on the punishment of two imprisoned Anabaptists Osiander expressed the opinion that it would be dangerous to punish them by worldly means, since the intention of these people was good. They should be taught with the Word of God. But if they persisted in their obstinacy, and consequently in their faith, they should be expelled from the country. In case they were preachers the authorities in charge should take a different course. After the reproaches made against the Nürnberg council following the execution in 1527 of the Anabaptist Wolfgang Vogel, the pastor of Eltersdorf, the councillors did not inflict the death penalty on any Anabaptists for refusing to join the Lutheran Church, merely sentencing them to prison and to indoctrination by the clergy. Thus Osiander and his colleagues held many unsuccessful religious discussions with Peter Riedemann, who was held in prison in Nürnberg. After a prison term of four years Riedemann was expelled in 1536. Not many years later Osiander's views on capital punishment for matters of faith underwent a radical change. One of the influences bringing this change about was probably his association with the astronomer Copernicus (d. 1543), whose discovery that the earth revolves around the sun was just as objectionable to church circles as was Anabaptist teaching. Osiander became a sponsor of Copernicus' famous work, De revolutionibus orbium coelestium, which was completed in 1530, but was not published until later. This change is seen in Osiander's booklet, Unterricht und Vermahnung, wie man wider den Türken beten und streiten soll (1542), which expresses views held by the Anabaptists. It is possible that the conversations he held with imprisoned Anabaptists were a factor in bringing this change about. "When God permits the Turks to rule and rage over the Christians, He does nothing other than to deprive by violence the false Christians of the holy Christian name which they still unreasonably keep and bear, who by a wild, rough, and heathenish life have long since despised Christ and through false doctrine lost and rejected Him, just as the badges are torn from a nobleman who has disgraced himself," says Osiander in the booklet. Then he enumerates the sins of Christendom: despising, falsifying, and persecuting the holy Word of God, abuse of the sacraments, false human doctrine, immorality, and unrepentant persistence therein, which are not adequately punished by secular or spiritual authorities. Therefore the Turk must be regarded as "the sharp disciplinary rod of God; one must earnestly repent, and pray God for enlightenment, that all the bishops and preachers preach His holy Word unadulterated, abolish all superstitious practices, spread the Word of God with gentleness and not with the sword and bloodshed, halt offenses by using the ban, give a good example by spotless living, and that all might humbly bow before His divine holy kingdom." 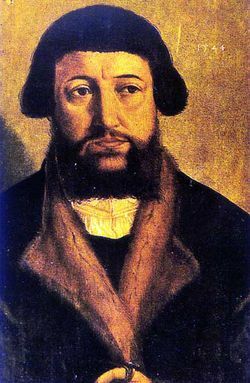 After the Augsburg Interim Osiander moved to Königsberg, Prussia, in January 1549, and became professor of theology at the university founded there five years earlier. Here the debate on his doctrine of justification absorbed his attention to the end of his life. Beck, Josef. Die Geschichts-Bücher der Wiedertäufer in Oesterreich-Ungarn. Vienna, 1883; reprinted Nieuwkoop: De Graaf, 1967: 40. Heberle, Wilhelm Heberle. "Johann Denk und die Ausbreitung seiner Lehre." Theologische Studien und Kritiken 28 (1855): 835. Hege, Christian. Die Täufer in der Kurpfalz. Frankfurt, 1908: 25 ff. Hege, Christian and Christian Neff. Mennonitisches Lexikon, 4 vols. Frankfurt & Weierhof: Hege; Karlsruhe: Schneider, 1913-1967: v. III, 312 f.
Hirsch, E. Die Theologie des Andreas Osiander und ihre geschichtlichen Voraussetzungen. Göttingen, 1919. Keller, Ludwig. Die Reformation und die älteren Reformparteien: in ihrem Zusammenhange dargestellt. Leipzig : S. Hirzel, 1885: 411-417. Moller, W. Andreas Osiander, Leben und ausgewählte Schriften. Elberfeld, 1870: 116, 204, 245 f.
Schornbaum, Karl. Quellen zur Geschichte der Täufer, V. Band (Bayern, II. Abteilung). Gütersloh: C. Bertelsmann, 1951: 260. Selle, G. von. Geschichte der Albertus-Universität zu Königsberg in Preussen. Königsberg, 1944. Wiswedel, Wilhelm. Bilder and Führergestalten aus dem Täufertum. 3 vols. Kassel: J.G. Oncken Verlag, 1928-1952: v. II, 26-28. Hege, Christian. "Osiander, Andreas (1498-1552)." Global Anabaptist Mennonite Encyclopedia Online. 1959. Web. 23 Apr 2019. http://gameo.org/index.php?title=Osiander,_Andreas_(1498-1552)&oldid=145970. Hege, Christian. (1959). Osiander, Andreas (1498-1552). Global Anabaptist Mennonite Encyclopedia Online. Retrieved 23 April 2019, from http://gameo.org/index.php?title=Osiander,_Andreas_(1498-1552)&oldid=145970. Adapted by permission of Herald Press, Harrisonburg, Virginia, from Mennonite Encyclopedia, Vol. 4, pp. 89-90. All rights reserved.